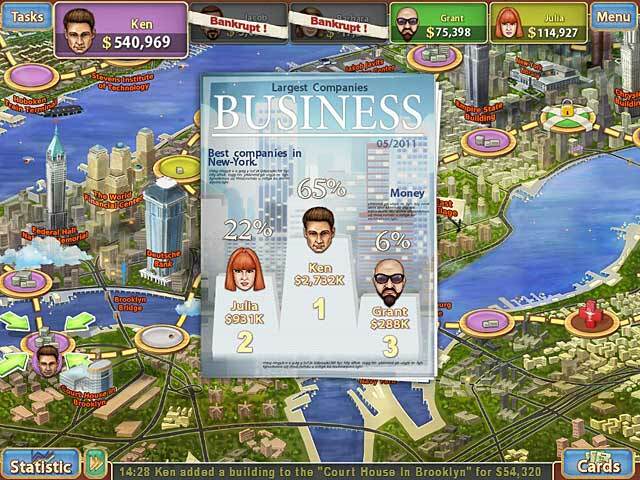 Purchase real estate in different cities, and make your company a fantastic success story in Trade Mania! Corner the real estate market as you master unique economic gameplay. 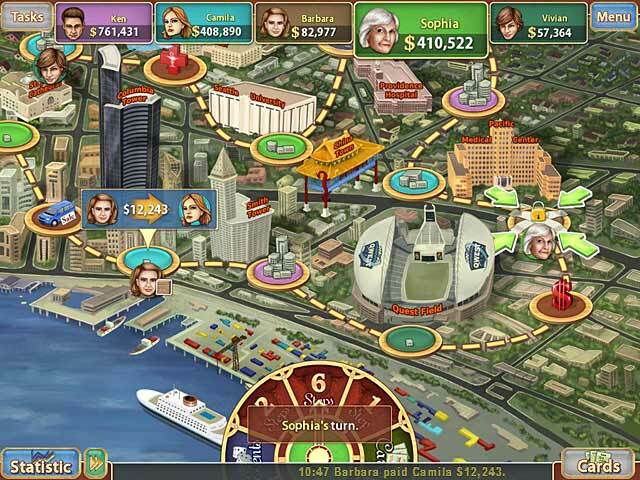 Play through maps of actual megalopolises and feel like a real millionaire. 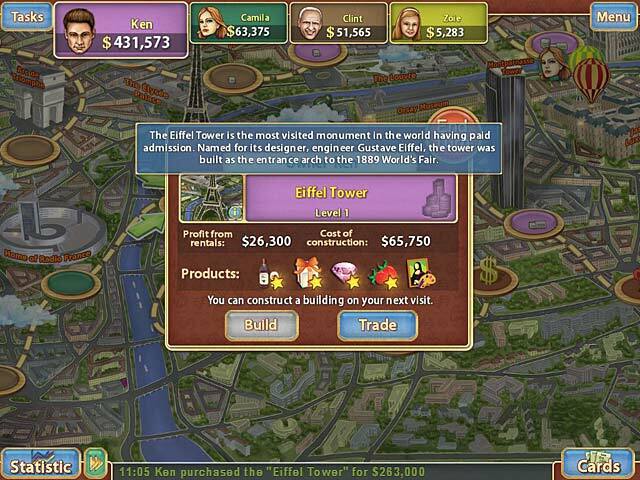 Dominate the market and become a mogul in the world of Trade Mania! Corner the Real Estate market! Trade Mania is rated 4.3 out of 5 by 55. Rated 5 out of 5 by ScratchMJ from LOVE THIS GAME! I love this game, I really wish there was another similar game to play. I have over played this one now. Rated 5 out of 5 by pogi10 from Excellent - Only game I have ever reviewed The game is awesome and each game is a new adventure. Waiting for the next version!!!! Rated 5 out of 5 by xxkayoticxx from Awesomeness I love it! I can't stop replaying it! Rated 5 out of 5 by bsbchiew1008 from Excellent, mindless fun! I have spent hours upon hours on this gem-of-a-game! It never repeats itself, and gets you really hooked! (many a times I've shouted gleefully over purchasing the Statue of Liberty lot, or silently cursed over being involved in 3 accidents consecutively). There's a strategy to it (duh), and once you get the hang of it, you'll have a sure-fire way of winning every time. That being said, the level fun or difficulty doesn't lessen, and I'm still as addicted to this game as I initially was when I first purchased it many, many moons ago. Always good for a revisit, and a great way to spend a few hours! Highly, highly recommend! Rated 5 out of 5 by SimbaKomba from I was skeptical but..... I am addicted! To be totally honest, it's a no brainer but it really does hook you in. If you've had a hard day and you just want to play something that is engaging but won't over work your brain cells, this just may be the game for you. Give the demo a go and see if it suits. I'm glad I did. Rated 5 out of 5 by ffuryy50 from Love love LOVE this game!!! 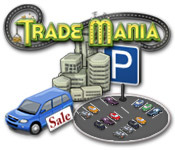 I don't think you have to be a Board Game lover either to enjoy Trade Mania.... It took me a mere ten minutes into the free trial to know that I was going to buy this one... I chose to play the computer characters and am having so much fun! I HATE Monopoly by the way -- boring to the core because you're either the clear winner or the clear loser and it takes you hours to finally do so. This game takes hours as well, BUT~ it's hours of enjoyment! It is obviously a game you can play over and over and over again.... which is a huge plus in my book! I do love the adventure games but have to wait months after playing one to do so again because my memory kicks in... Trade Mania is different every time you play.... I HIGHLY recommend this game! Enjoy! Rated 5 out of 5 by starrynightskye from Challenging There is more than just aquiring a real estate empire going on in this game. In addition, you're trading products and gambling on their futures which can inject some serious buying power into your bank account. Like Monopoly, it can be kid-friendly fun or ruthless empire building. Love it!